Chris Coleman says he is "fully focused" on Wales after Hull City failed in their attempt to make him their new manager. The Football Association of Wales (FAW) rejected an approach from the Tigers as they sought to replace Steve Bruce. "There was an approach, the FAW turned it down, that's the end of it," he said. "I want to work at the top level like everybody else but that doesn't mean to say that's the Premier League for me. "I've said before I'd like to work in Europe again. That's not to say I don't want to work in the Premier League - it's a great league, it's recognised as the best in the world. "But what I've got here is something very special and close to my heart." Hull have still not found a permanent manager to replace Bruce and, despite starting the campaign with only 13 fit senior players, they have won both their Premier League fixtures so far this season under caretaker boss Mike Phelan. Coleman was in Cardiff on Wednesday to name his squad for the opening 2018 World Cup qualifier against Moldova on 5 September. The 46-year-old has said this qualifying campaign will be his last in charge of Wales but has no desire to resign before the end of his contract. 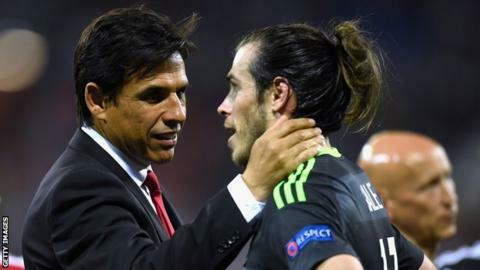 "It's difficult for me to walk away from Wales, especially now, on the back of what we've done and on the eve of a World Cup campaign," Coleman added. "I'm not going to tell a lie. If someone comes and it's the Premier League, you kind of look at it sideways, of course you do. "I'm the manager of my country. That comes around once if you're lucky."